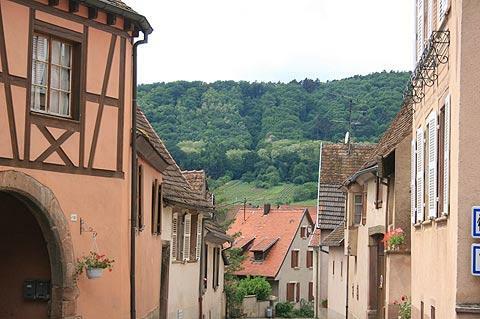 Mittelbergheim lies about 30km SW of Strasbourg in the Bas-Rhin department of Alsace and only a short way south of Barr. 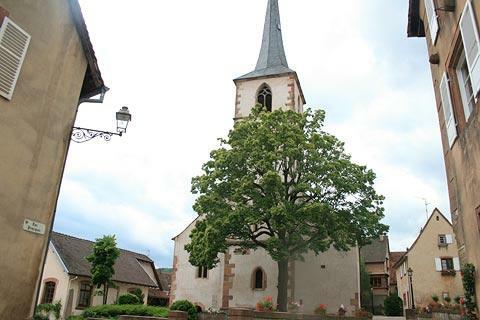 It is officially classified as one of the 'most beautiful villages of France'. Sitting on a limestone hill surrounded by vineyards, Mittelbergheim has been a wine-growers village since the 17th century. 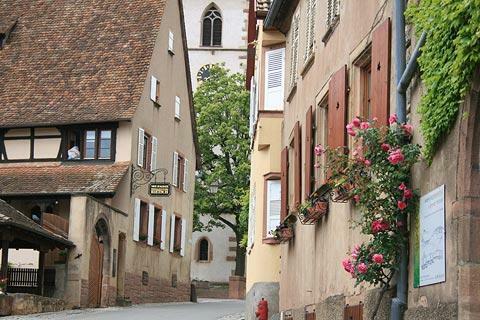 It is an unusual village in Alsace in that the buildings have not been painted - they have been left their natural pinkish-grey colour. 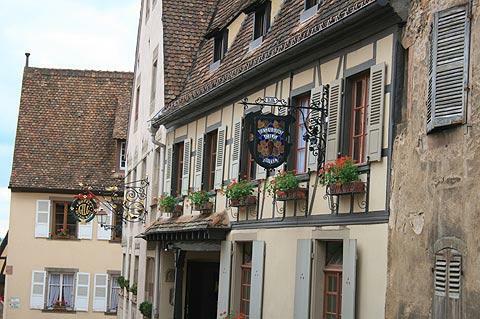 You will notice the connection with wine as you explore the village - it seems that about every fourth house is a wine house offering wine-tasting (degustation). * The best known vineyard here is called Zotzenberg and produces a Grand Cru wine. As a distraction from wine tasting be sure to visit the two churches in Mittelbergheim. The church built in red sandstone is the catholic church and dates from the end of the 19th century, while the white church is the protestant church and dates from the 13th century (with significant modifications in the 17th century). Given that several centuries passed between their dates of construction it is the similarities that will strike you most, both being dominated by tall thin square towers with tall thin spires on top. 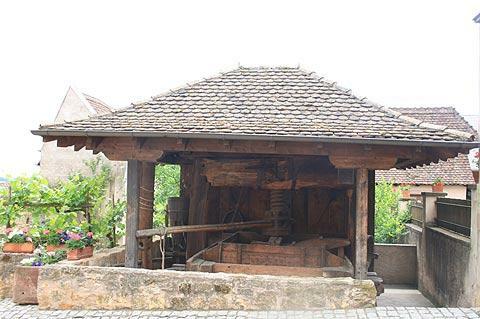 Other little interesting features include an ancient oil mill on the Rue Principale (the grindstones were originally turned by a wooden mechanism that was in turn powered by a horse) and an ancient well on the rue Principale. 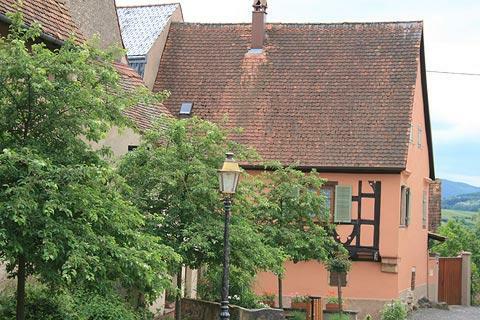 Most of the village centre in Mittelbergheim is a result of a substantial reconstruction of many of the houses that took place in the 16th century, typically in the renaissance style. As you explore the streets and alleys of the village keep an eye on the wrought iron shop signs which are also very decorative. A little way out of Mittelbergheim you can see an attractive ancient fountain - the fontaine de la Sinn. 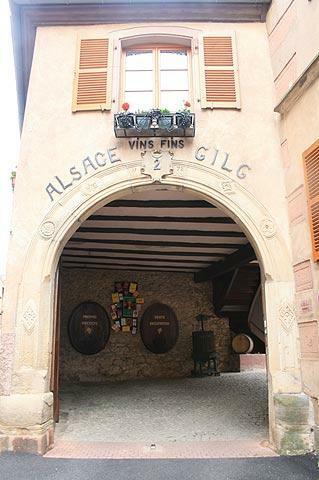 There are several marked footpaths around Mittelbergheim that will lead you through the vineyards, or perhaps to the castle at Andlau or up Mont-Sainte-Odile next to the village.